Respawn Entertainment's Apex Legends had the best launch month of any free-to-play game, according to SuperData's latest report. 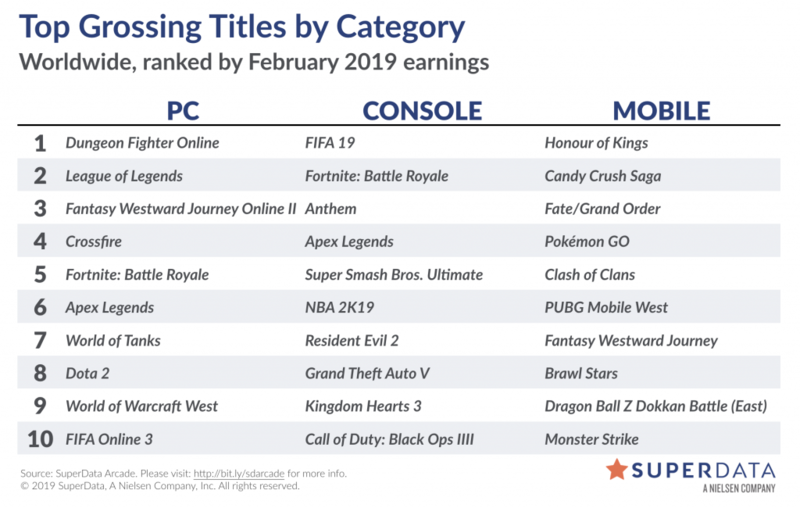 SuperData, which measures digital spending in games, estimated that $92 million was spent in-game by Apex Legends' players in February, the majority of which came from console. However, while SuperData has never recorded a higher figure for the launch month of any free-to-play title, Apex Legends didn't make it to the top of either the PC or console chart last month. Indeed, Epic's battle royale shooter Fortnite was placed above it in both. At GDC this week, Epic revealed that Fortnite now has 250 million players across all platforms. Another key launch, EA BioWare's Anthem, earned more than $100 million in digital revenue, despite only launching on February 22. According to SuperData, Anthem was the best-selling premium title by digital units on console last month -- unit sales being the main source of its revenue, given the $3.5 million in-game spending across PC and console. Anthem's console revenue was enough for it to place above Apex Legends in SuperData's chart. Overall, the digital spend on games across console, PC and mobile was $8.2 billion last month, up 2% over the prior year.